I'd imagine that the venerable Dynaco ST-70 is the most well recognized tube amp in the world. It was introduced in 1959 and was sold until mid-1990. Over 300,000 of the ST-70s were produced, and more continue to be built as kits from companies like Tubes4HiFi and Triode Electronics. 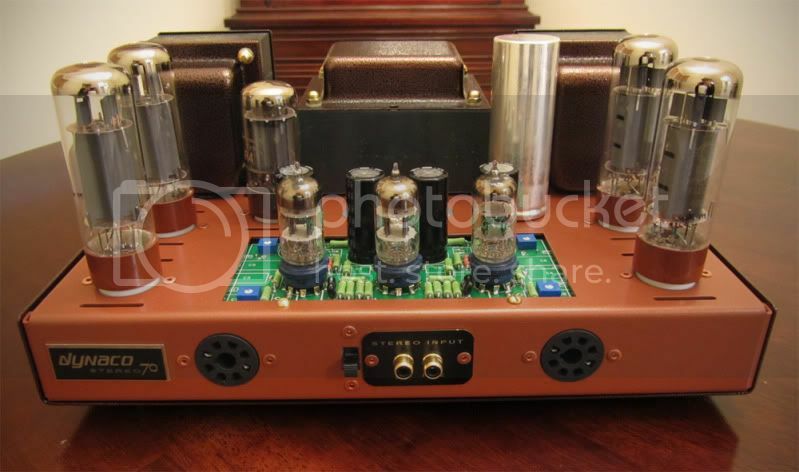 The Tubes4Hifi recreates the chassis exactly as it was (aside from heavier gauge stainless steel) with holes for screw-in posts, pre-amp power draw tube sockets up front, the stereo/mono switch, and other nostalgic things that aren't used today but will make your build look authentic. 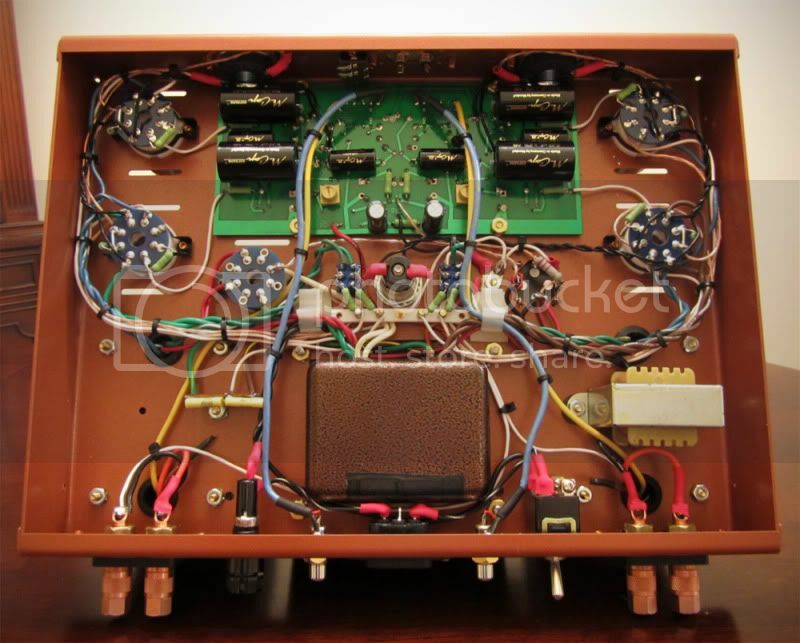 The Triode Electronics kit eliminates the superfluous holes in the chassis and makes use of a cap board inside rather than the tall quad cap, along with a different driver board. Holes had to be drilled/cut for the new RCAs, larger switch, pilot light, solder strip and IEC. Since the chassis is 16 gauge stainless, it takes a bit of effort. The binding posts required a little bit of modification but fit in the existing slots. I used black lacquer coated phenolic boards and drilled them out to hold the posts in place. 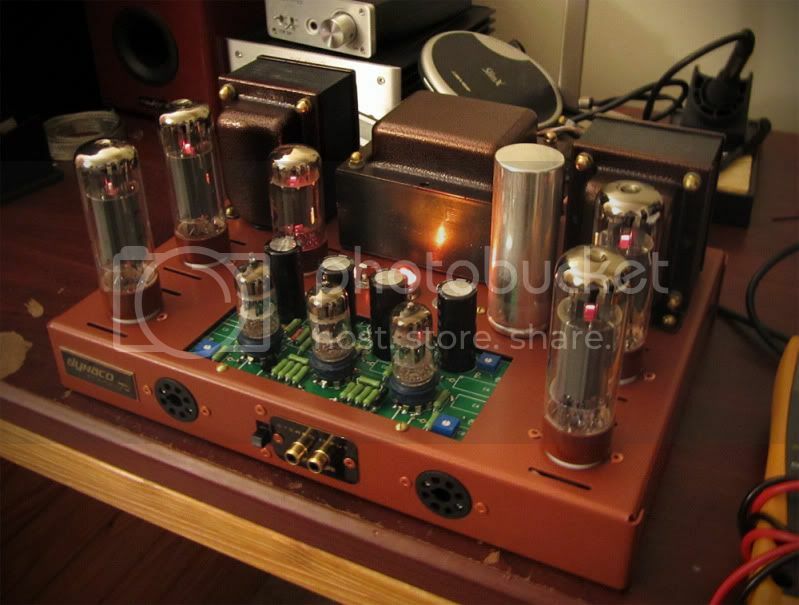 The tube compliment is Sylvania JAN input tubes, Winged C output tubes and Sovtek rectifier. It was a fairly easy build and a recommendable kit. The sound is lush and engaging. Looking for Mundorf Capacitors for your build (among other great DIY parts)? Check out AuDIYo.com - Quality High End Audio Components and Parts. How do you like the sound of your VTA 70? I built the kit stock with metal film resistors and find the sound a little bright for my liking. Basically I'm wondering if the Kiwami resistors would tame the sound. The Kiwame carbon films are more agreeable to my ears than the metal film, but resistor differences are more subtle than tube-rolling. Are you running Svetlana Winged Cs for power? They might be worth a shot before you break out the soldering iron. I really like that custom panel for the RCA input jacks. Would you mind describing how you built it, and what with? Thanks! It actually didn't take much effort. The RCA openings were measured and I created a vector file with the fonts and openings. This was sent over to a brass engraver who dropped a black covered piece of brass into their machine and out it came. There are places online like US Brass Shop and Halex that can handle this for you. No worries at all Matt, feel free to post as often as you'd like. Yes, the manual for the VTA-70 and VTA-70 driver board are very fleshed out, much like the Bottlehead kits. I don't recall if it documents soldering technique, so I'd recommend checking out the resources at the AMB Labs website: http://www.amb.org/audio/ and watching the soldering tutorial videos. I also recommend the book MAKE: Electronics by Charles Platt, it really goes over all the basics in a simple and easy to understand format. If you have specific questions, it would be a great place to post them, as there are quite a few members at DIYAudio who have much more experience than me. Are you getting any noise injection from having the RCA in the back so close the to AC lines and transformers? I've had others ask me the same thing. Nope, no noise. The wiring for the RCAs is relatively thin at 24 gauge and is shielded, which I'm sure helps. I have more than one dyna 70. I have one with the Dyna mutts mod. from Classic Valve Design from 2009. It use 6FQ7's as drivers, has the constant current source with the feedback loop around it. It sound a bit hard. Wondered if anyone out there experience this. Have had more that one Dynaco 70. I have one with the Dyna mutts mod. It uses 6FQ7's for driver tubes, has the constant current source with the feedback loop around it. Although the amp performs well in many ways, I tend to he a bit of a hardness in the mids and hi's. I wonder if anyone share this opinion and if there is a simple way to get it sounding a bit sweeter. Beautiful! I may purchase one of Bob's kits soon. 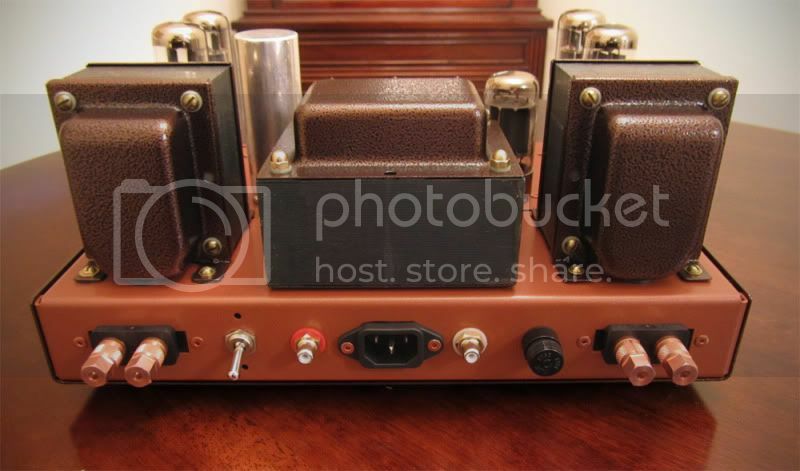 I must say the work you did on the chassis and transformer bells makes your amp fun to look at. Shiny chrome is always nice, but I'm afraid I'll not be able to build the kit without wishing it looked more like yours! Thanks for the kind words Shawn, highly appreciated. I'd love to see your build once you get underway. Bob offers a mean piece of kit for sure. Nice work. What type of bit did you use to drill the holes from the rca inputs? What size bit did you use? I'm assuming you used a drill. Hi Talmage, I used a stepped drill bit. You can get a cheap one from HarborFreight, or if you want to invest in a nice one, go to the electrical section of Home Depot and get one made by Klein. Looks killer! Where did you place the pilot light in the circuit? Is it LED? Hi there Jake, if I recall correctly it's off the tube heaters. It is indeed an LED that works with the old bayonet style lights.